Powerlines! I shook my fist. 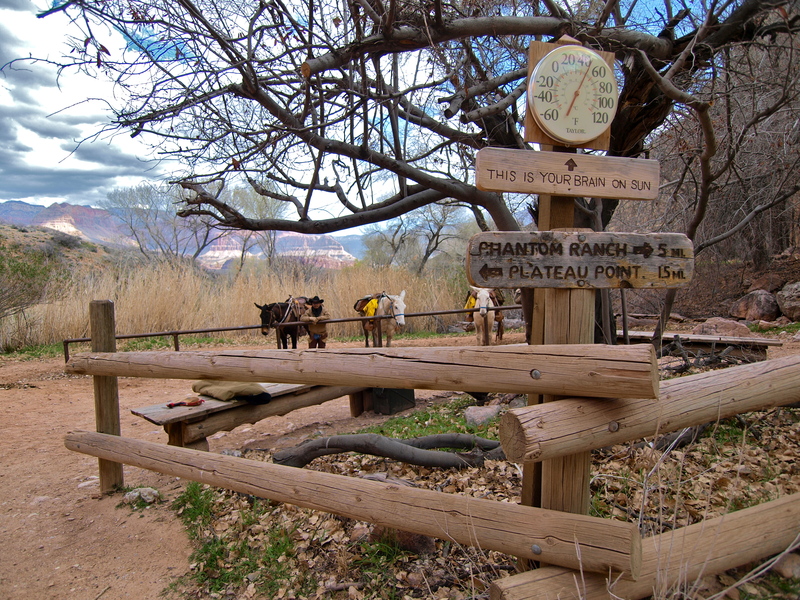 Crossing the Tonto Platform, we had gone more than 30 hours without seeing anybody else, but as we passed the turnoff for Plateau Point and arrived at Indian Gardens, we met a mob. Indian Gardens is a major hub, connecting the Tonto Trail with the Bright Angel Trail and four mules, two guides, two riders, a dozen hikers, four backpackers and a park ranger were all milling about, putting an end to our solo revery. All of the day hikers had come down Bright Angel from the rim and were heading out and back to Plateau Point. A few were on their way to Phantom Ranch for the night and some had just come from there. 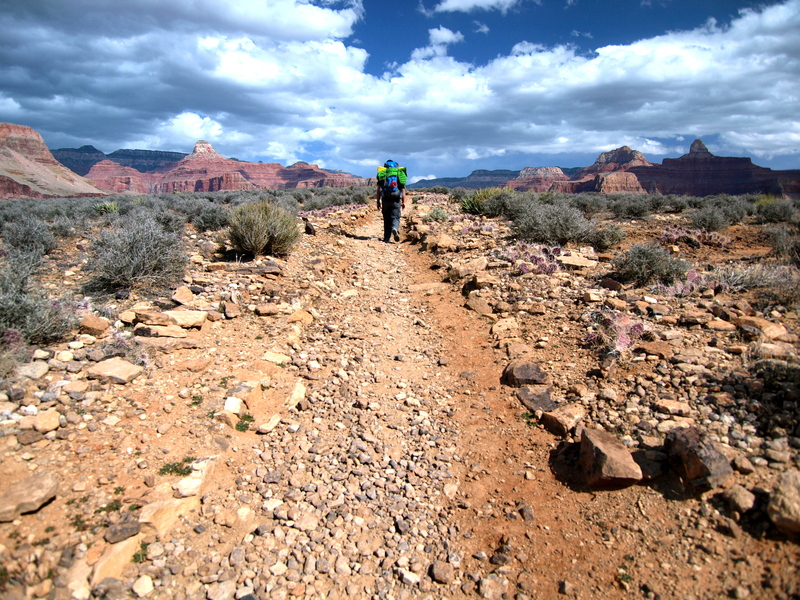 The backpackers had all arrived from the Tonto Trail to the east, having hiked down the South Kaibab Trail a day or two earlier. We were the only travelers from the west. The mules weren’t the only beasts; three obesely spoiled squirrels were waddling around, begging for food. At one point, two chased each other, as squirrels do, and it was the slowest, most pathetic game of squirrel tag I’ve ever seen. 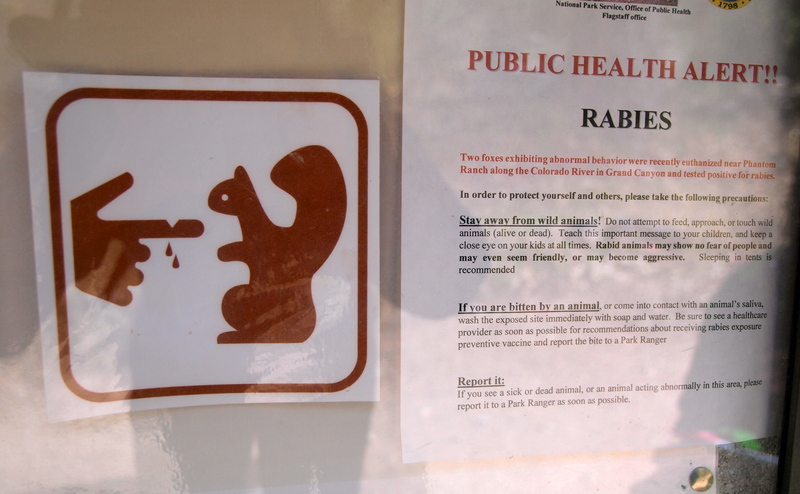 Clearly the signs warning against feeding the killer rabid squirrels are not much of a deterrent and they have been getting way more than their fair share of free people food. Grand Canyon squirrels will eat anything, including fingers. We hiked up to the campground and unloaded most of our belongings into the old Army ammo cans provided by the park service to keep the critters from chewing holes in our stuff. All of our food stayed in the bear canister, which is so secure, I could barely open it using tools and all ten fingers. 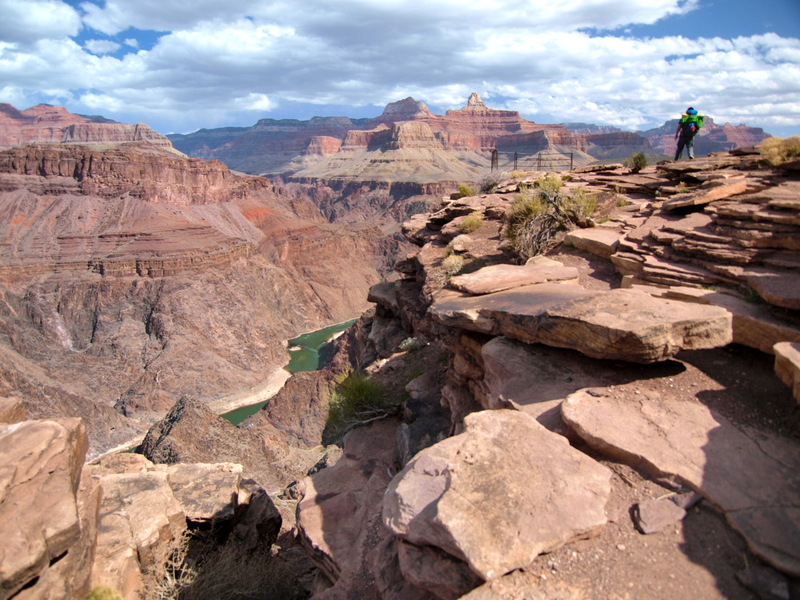 Our packs nearly empty, save for a few snacks and books, we retraced our steps a mile and a half back down the Tonto Trail to spend the afternoon relaxing at Plateau Point, one of the most famous overlooks inside the canyon. 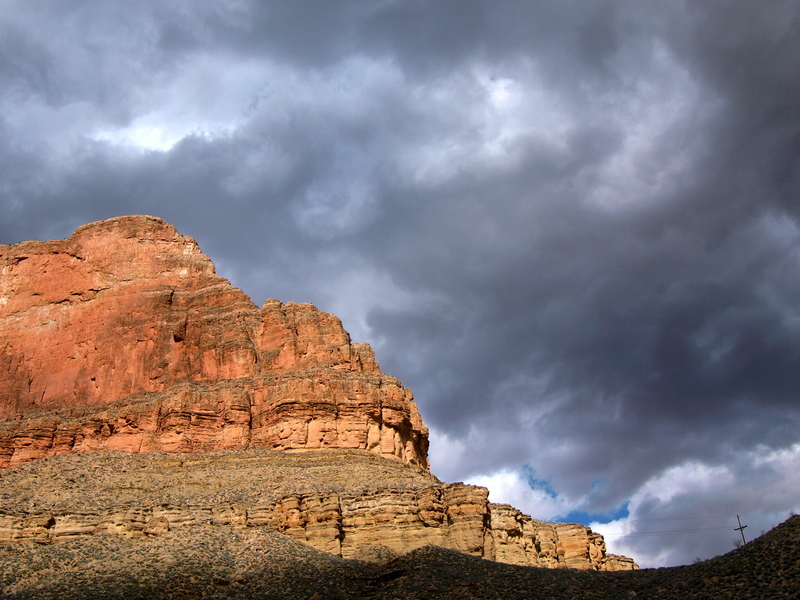 From Plateau Point, the sky was magnificent! After three days of hiking under a bright blue bowl, the canyon was now full of weighty storm clouds. Most of the time it was breezy, but every now and then, we’d hear a roar from down canyon and a few moments later, a wall of wind would tear by, heading east, promising snow. Even after 4 days on the trail, I felt pretty good, and I did some yoga on a ledge in the sun. When I’m backpacking, I make a point to stretch mornings and evenings and throughout the day. I also take off my boots whenever I stop to rest for more than a minute. Taking care of your feet is of utmost importance on the trail! As they say with horses, no hoof, no horse. Blisters and foot problems are misery on backpacking trips. Keeping your feet dry, wearing high quality socks and doctoring sore spots (moleskin & duct tape!) before they become blisters all help keep feet happy and healthy. Bright Angel Trail down to the Green Colorado. 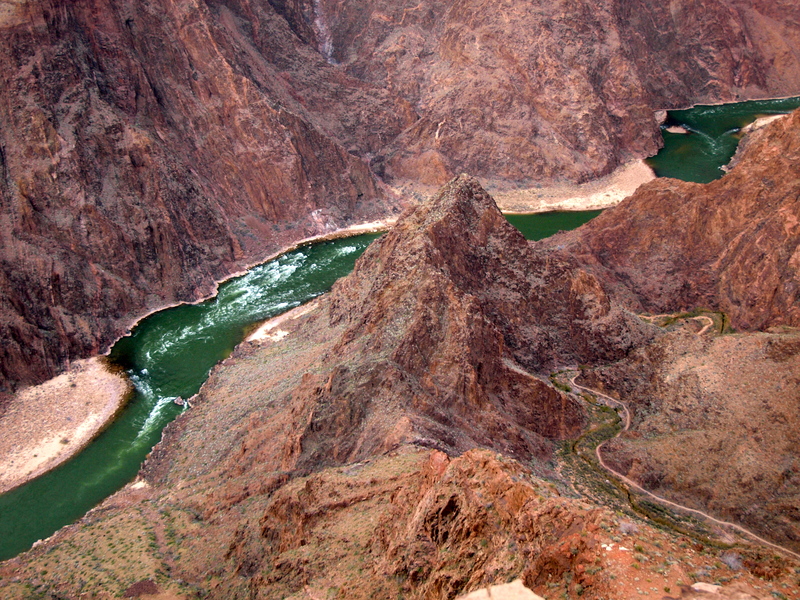 The footbridges to Phantom Ranch are just upstream from here. The winds brought two ravens, who flew past us surfing a gust and then clacking and cawing to each other, circled back to check us out. They hovered above us, riding the wind, and then, wings cocked, feathers shearing, talons reaching, they landed on the rock at my feet. I’m sure, like the squirrels, Grand Canyon ravens are conditioned to associate people with food, but it was nice to be paid a visit by my favorite birds. In my next life, maybe I’ll come back as a Grand Canyon raven. We ended up hiking back to Indian Gardens to cook dinner and then back out to Plateau Point again for sunset, a round trip of 6 miles, making this another 10-mile day. So much for our day of rest before hiking up and out of the canyon on Bright Angel! Me at Plateau Point, my hat stowed due to high winds! 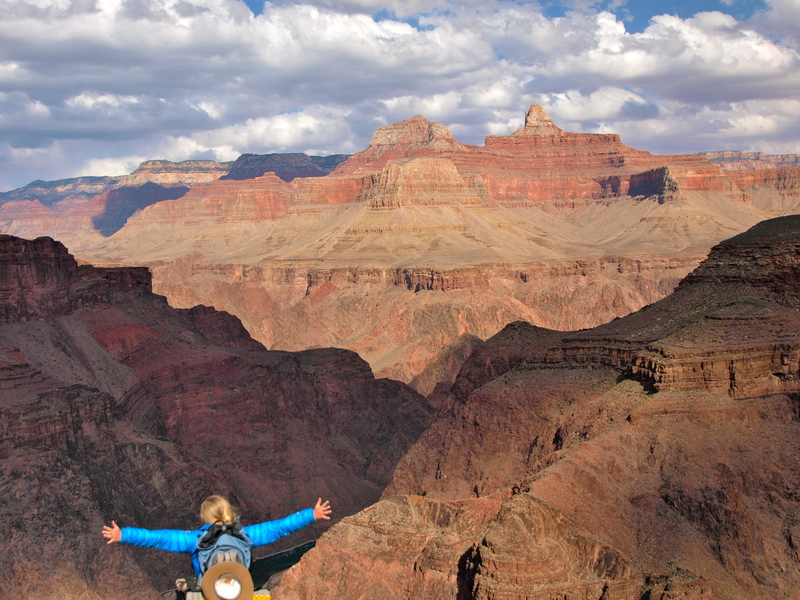 This entry was posted in Hiking!, Photography, Uncategorized, Vagabonding 101 and tagged backpacking, grand canyon, ravens, winter. Bookmark the permalink. Dangerous squirrels – cool 🙂 Great pictures! I’m glad I found your blog, kinda makes me want to plan a hiking trip somewhere myself! I’m really glad I found your blog! Now I kinda want to start planning a hiking trip myself somewhere! I live in Wisconsin, and I know that’s a hot spot for camping, hunting, etc. I have been to a couple places because I used to be in Scouts, but not many. Well that’s the great thing about hiking: other than gas to get to the trailhead and some gear, it’s free! You shouldn’t have a big investment to start hiking: a good pair of shoes and a daypack and you’re set. Does your school have an outdoor/ hiking club? They may be able to give you some local tips and/ or lend you gear. I’ve spent a little time in Wisconsin, but that’s one corner of the country I need to revisit! If you ever get a chance, the UP has epic backpacking in the Porcupine Wilderness. I’ve found a few outdoors groups at my school and I’ll be sure to check them one or two of them out next semester. Though I would love to try and convince my friends to go on a trip with me. I’ve never been the UP. The farthest north I’ve been is either Door County or Rice Lake; I’m not sure which is further. Horseshoe mesa campground.. Have you been?